Modern beadwork is often used as a creative hobby to create jewelry, handbags, coasters, and dozens of other crafts. Beads are available in many different designs, sizes, colors, shapes, and materials, allowing much variation among bead artisans and projects. Simple projects can be created in less than an hour by novice beaders, while complex beadwork may take weeks of meticulous work with specialized tools and equipment. Many free patterns and tutorials can be found in Internet. 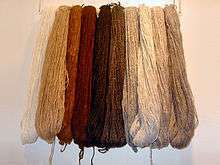 This process was probably discovered first in Mesopotamia and then imported to Egypt. However, it was the Egyptians who made it their own art form. 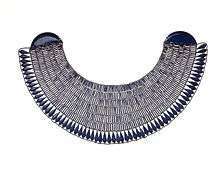 Since before the 1st dynasty of Narmer (3100 B.C.) to the last dynasty of the Ptolomies (33 B.C.) and to the present day, faience beads have been made in the same way. 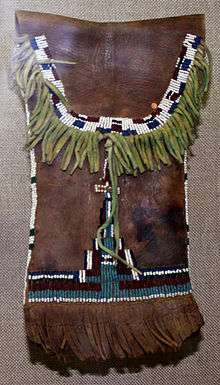 Beadwork is a quintessentially Native American art form which evolved to mostly use glass beads imported from Europe and recently Asia. Glass beads have been in use for almost five centuries in the Americas. Today a wide range of beading styles flourish. ↑ "Beadwork". Merriam-Webster. Retrieved 3 May 2014. ↑ Dubin, Lois Sherr (2009). The History of Beads: From 100,000 B.C. to the Present. New York: Harry N. Abrams. p. 16. ISBN 978-0810951747. 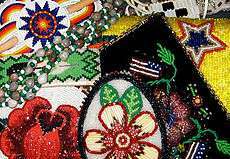 ↑ "Free beadwork tutorials and patterns". ↑ Fernandes, Beverly. "Faience Beads from Egypt". Retrieved 17 June 2014. ↑ "Broad Collar". Retrieved 17 June 2014.